Whether you've been boating, hiking, or just relaxing, there is nothing like a great meal at Singing Springs Resort. Lunch BBQ, May 1 through October 15 from 11:00am to 1:00pm. Children under 10 half price. Children under 4 free. Includes a generous selection of our freshly made signature salads as well as a unique Garden Bar to help you create your own. Includes freshly baked buttermilk biscuit or corn bread muffins and a trip to our Table of Sweet Treats. Includes the Soup, Salads & Sweets Bar plus all the trimmings to create your own BBQ masterpiece! 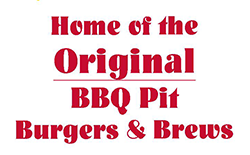 The "Pit" includes Southern fried chicken, Smoked Brauts, Housemade Pulled Pork, Smoked Pork Loin & hand rubbed Smoked Turkey; corn-on-the-cob (fresh from local gardens when available), Ranch Baked Beans, fresh buttermilk biscuits or corn bread muffins. BBQ Beef Ribs for $3.00 more..! Buffet is Atkins®, South Beach®, and Weight Watchers® Friendly! Simply select appropriate items from our Bars. Pulled Pork Sandwich...House smoked pulled pork with spicy Cole slaw piled high on a toasted Kaiser roll. Braut Torpedo...Flavorful smoked Braut smothered in grilled onions and peppers nestled in a hoagie roll with pepper jack cheese. Ortega Burger....Flame broiled 1/3 lb. fresh pure beef patty layered with a grilled, mild green chili and Swiss. Ruben...Tender corned beef on grilled marble rye with sauerkraut and Swiss. All of our delicious sandwiches are served with home made kettle chips, sweet potato fries or pasta salad and a pickle spear. All Burgers are 1/3 pound flame broiled, fresh pure beef patties. Add cheese or split any sandwich for $1.50 more. Diced local apples baked with a crispy topping. We are proud to offer a nice selection of Oregon Craft and Premium Beers on tap as well as award winning wines from our own Pacific Northwest available by the glass or bottle.